What happens on tour stays on tour, right? Not if your names are Steve Aoki, Angger Dimas, Dimitri Vegas, & Like Mike, and you’ve got your collective production freak on! Spawned from late night, long hour sessions aboard the infamous DEADMEAT Bus during this winter’s critically acclaimed Tour, comes the foursome’s brand new lovechild ‘Phat Brahms’. A high-energy, big-room, dance floor piece of dynamite that you’d expect from such an electric pool of production talent, the track has been causing pandemonium wherever and whenever any one of the foursome dropped it in a set – perfect case in point, the sensational four-way set at Tomorrowland 2012 when Steve Aoki officially announced the track’s release in front of thousands of EDM faithful fans. 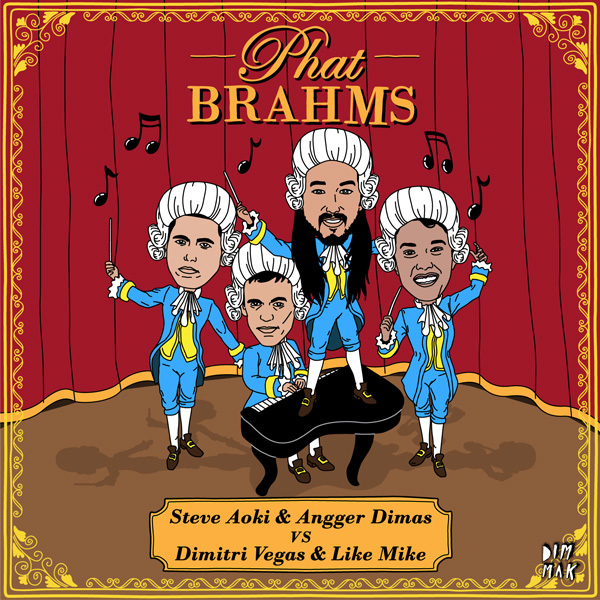 Released on Aoki’s mighty Dim Mak Records, Steve Aoki & Angger Dimas vs Dimitri Vegas & Like Mike – ‘Phat Brahms’ – sees the light of day only through Beatport today, October 2nd 2012.